These nutty and fruity pancakes were the centerpiece of our dinner on Saturday night. I am always amazed at how many my girls can eat- especially because they like to smear some peanut butter on them in addition to honey or maple syrup! Place pancake mix, oats, and cinnamon in a large bowl and stir. Add all remaining ingredients except berries and stir just until moistened and blended. Gently fold in berries. Cook pancakes on a griddle over medium heat, flipping just once. 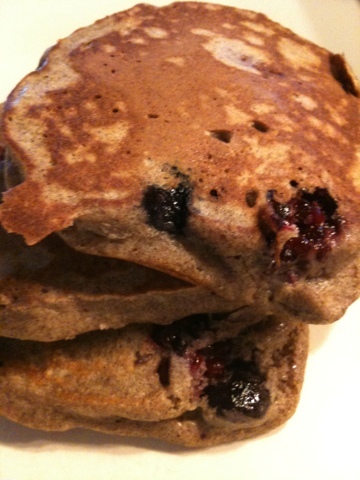 Serve with Earth Balance butter spread and pure maple syrup, honey, peanut butter, or whatever topping floats your boat!